What are ISO files, and how do I open them? I have a file that contains some information. I want to open it, but I apparently don't have the right program installed on my computer. The file type is .iso. How can I open it? An ISO file is just a disk image. Put it on a disk. Make it look like you put it on a disk. Continue Reading: What are ISO files, and how do I open them? Are you trying to come up with a solution to the end of XP support? Are you suddenly getting a bunch of spam, or are you looking for an alternative to Microsoft Office? All that and more in this Answercast from Ask Leo! Why is my machine so slow after a recovery from malware? Not only is malware written with bad intent, but it is often written badly. It can leave a mark on your computer's performance even after it's been removed. Continue reading: Why is my machine so slow after a recovery from malware? Will preventing XP from reaching the internet keep me safe? Keeping an XP computer off the internet will also prevent it from keeping any anti-malware tools up-to-date. You may end up less safe than you think. Continue reading: Will preventing XP from reaching the internet keep me safe? Is OpenOffice a viable alternative to Microsoft Office applications? Depending on how you will need to use your word processing program, you may be able to find a good alternative to Word in free software. Continue reading: Is OpenOffice a viable alternative to Microsoft Office applications? Why am I suddenly getting spam in my inbox? It can be very frustrating if it suddenly seems like spammers have found you. There is one thing may help your email provider catch up and slow the deluge. Continue reading: Why am I suddenly getting spam in my inbox? Can I delete what my anti-malware program puts in quarantine? Continue reading: Can I delete what my anti-malware program puts in quarantine? Can Windows XP even run without a network? An XP machine can run without a network. But would it still be useful? 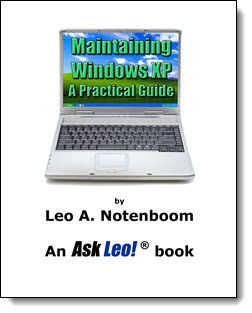 Continue reading: Can Windows XP even run without a network? Let's make it last even longer! PDF now 50% OFF the cover price. I'm drowning in spam. What can I do? Why don't anti-malware tools work better? Where did these oddly named folders come from, and how do I get rid of them? Would deleting Facebook help clear up a malware infection? Why does Windows file explorer right click take so long? Why aren't my friends getting my email? Is it safe to download from download sites? Your article reminded me of something Albert Einstein once said: Don't fill your head with what is written somewhere. Just remember where it's written. Also, early in my first military career a sergeant told me that things keep changing, so rather than memorize things, just remember where to find the information. These two pieces of advice have been with me ever since. The second thing is to use what you already know as a building block to learn something new. Thirdly, learn how to research. Often manuals and help files prove to be invaluable. Also, frequently there are forums where users can ask a question and get useful help from other users. The major problem I have with search engines is they have to be too exact or provide way too many 'matches' to be useful. Of course, it always helps to subscribe to newsletters, such as AskLeo. The only problem there is remembering which article had the information I need. I, too, am frequently asked how I knew how to do something. Truth is, I didn't. It just seemed logical, or was a lucky guess based on experience with something similar. If faced with the same problem again, I usually have to experiment until I find out how I did it the last time - or two, or three. No day is a waste if you either learn something new, or teach someone else something. I can certainly relate to what Leo says. At work we use custom software and part of my job is to support my coworkers when they have questions or error messages they can't resolve. To make things more challenging, I don't use all parts of the software in my job. People think I know everything. The reality is, like Leo says, I don't know everything. I know how it's supposed to work, so I have a baseline to compare it to. And so some of my suggestions are just guesses. But they are educated guesses. I've been using Ninite for years and have found it to be a great resource. It automatically downloads and installs about 100 of the most popular freeware programs, including most of the free programs recommended on Ask Leo!, while automatically rejecting all of the foistware and browser hijacks. You don't have to download all of them; you just check the boxes on their website for the ones you want. I use it especially when I'm setting up a new computer. It saves hours of time as you don't have to do anything after you've chosen the programs and run Ninite. Will April 9, 2014 be a Very Bad Day for Windows XP Users? Hey everyone, I'm Leo Notenboom for askleo.com. "Malware authors today are sitting on their XP zero day vulnerabilities and attacks, because they know that after the last set of hot-fixes for XP is released in April 2014, that their exploits will work forever ¦"
Continue Reading: Will April 9, 2014 be a Very Bad Day for Windows XP Users? Just a quick note to let you know that Saved! Backing Up with Macrium Reflect is out. Saved! Backing Up with Macrium Reflect and Saved! Backing Up with Windows 7 Backup together both update and replace my older book Maintaining Windows 7 - Backing Up. Important: If you already own Maintaining Windows 7 then you already own the replacement books. Simply register your book if you haven't already (there's a link in the book), and then go to the registered owners page. There, below the companion videos and other bonuses are download links for the PDF versions of both new books. Also Important: If you don't own Maintaining Windows 7 you have until April 1 to buy it. That way you'll get all three books - Maintaining Windows 7, Saved! for Windows 7 Backup and Saved! for Macrium Reflect - for the price of one. Maintaining Windows 7 will be removed from store shelves on April 1.